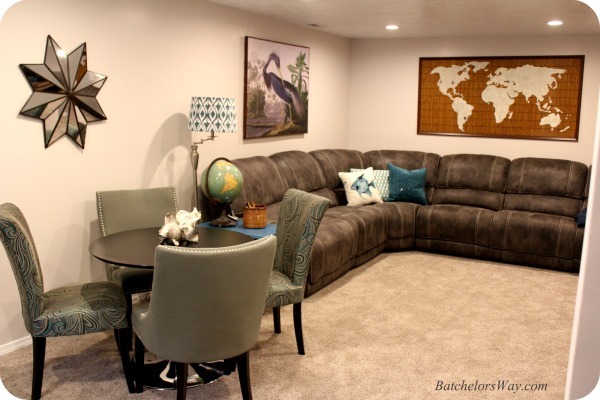 Batchelors Way: Nana's Day - Basement Family Room Reveal!! 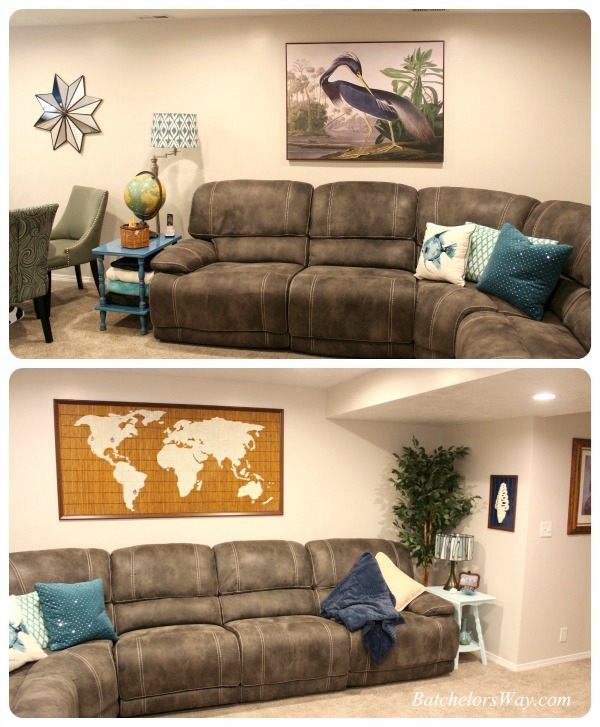 Nana's Day - Basement Family Room Reveal!! Are you finally ready to see Nana's finished basement? Gosh this was a labor of Love. But it is finally finished and she can enjoy her basement. I love the art work we finally decided on. We used some old frames she had to frame these two prints. Here is a cheap way to mat your prints. I mounted the prints on black card stock and then mounted the card stock into the mattes that came with the frames. Only problem was the mats were a grayish purple color and I wanted crisp white. You guessed it! I spray painted them. Wasn't sure if it would work, but I just used a few very light coats. Love how it turned out and it only cost the price of two sheets of black paper. I think they look both sophisticated and whimsical. I love the port hole curtains we made by turning store bought panels upside down. 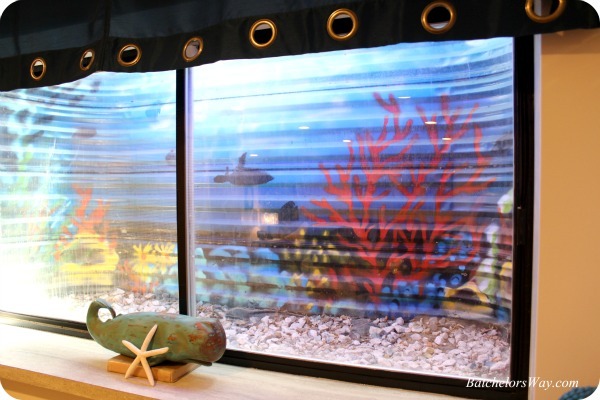 You can read more about that in this post, "Porthole Curtains with a View." These curtains highlight my son's spray painted window well. I talked my mom into buying this awesome carved whale from Marshall's. Function is key to this corner kitchenette. 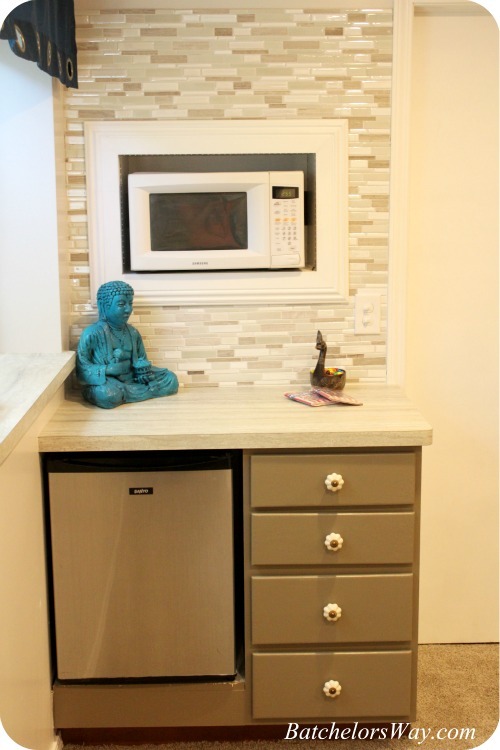 A mini fridge and microwave make movie time even better, with ample counter space for treats and snacks at party time. 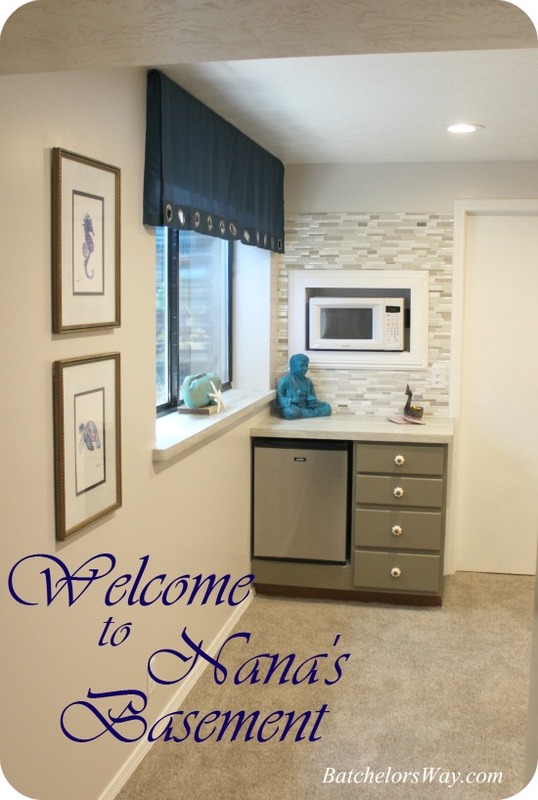 Nana loves her tile wall that sets the kitchenette apart and makes it shine. Oh, and her Buddha that we found at a second hand shop. We added some blue spray paint and black glaze, aged to perfection. 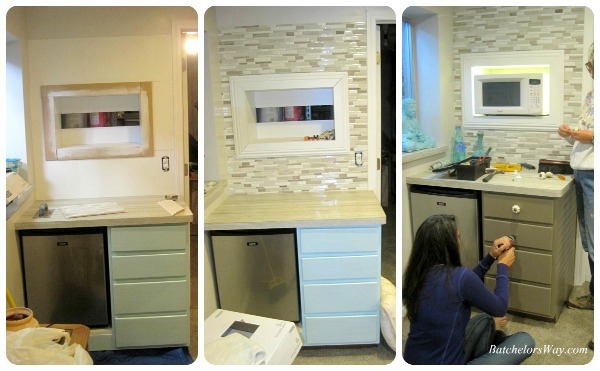 These cupboards started out as a used drawer base from the Restore. Here is a quick look at it's progression. But go check out what it looked like when we first got the parts for this kitchenette. This room speaks of travels from around the world. 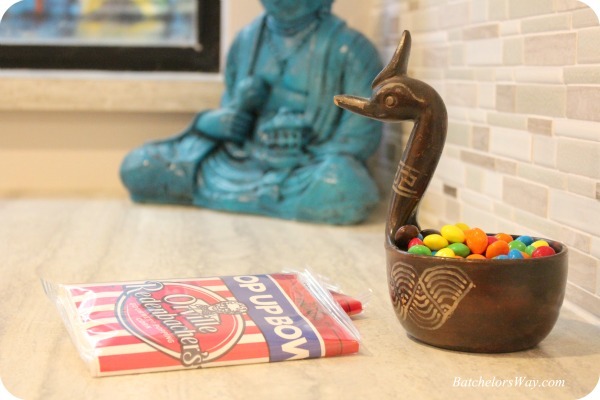 This candy dish is from Nana's trip to Mexico. The table and chair set replaced the antique pie safe; it just made more sense and had better flow. We found the table and four chairs at OverStock.com Outlet Center. When Nana couldn't decide between these two chairs, I suggested we use both. Two of each. I love the interest, colors and textures they bring to the space. Two are a woven swirl and two are a linen like grey with silver nail head trim. Gorgeous!! We found the mirror star at Target and the fish, that Nana just fell in love with, at Ross. It all makes a great grouping. This piece brings all the colors of the room together, it makes everything work! You can read about the day we found it and how we added eyeliner to this piece of art to make it pop. She had that amazing globe from her days of teaching school. I made her buy all those super soft color coordinating blankets which are functional as well as pretty, we use them when we come over to watch movies at Nana's house. This sectional is easily one of everyone's favorites. Its grey faux leather is so inviting, and has four automatic recliners built in!! The other end of the sectional has Nana's missionary map hanging over it. Go check out how we made this map from an old blind. This brings me to one of my favorite corners. Let's start with Nana's mask. She and I found this at a second hand store one day and Nana fell in love with it, but it needed something to give it more presence on the wall. 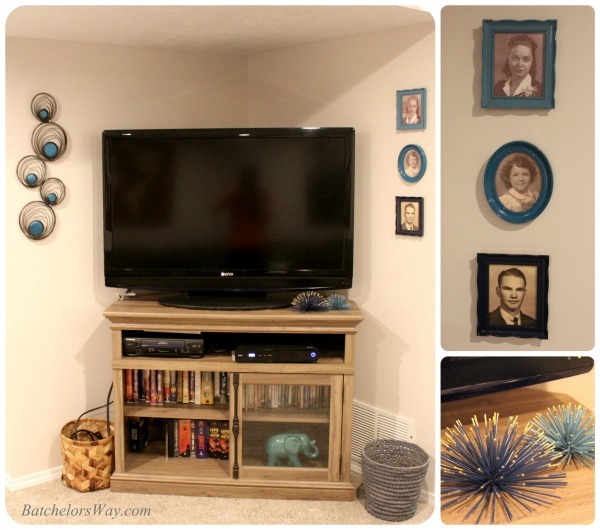 We took a scrap of bead board and painted it dark blue. Then we added left over trim from another project to frame it out. Once this mask was centered on the board it looked amazing. 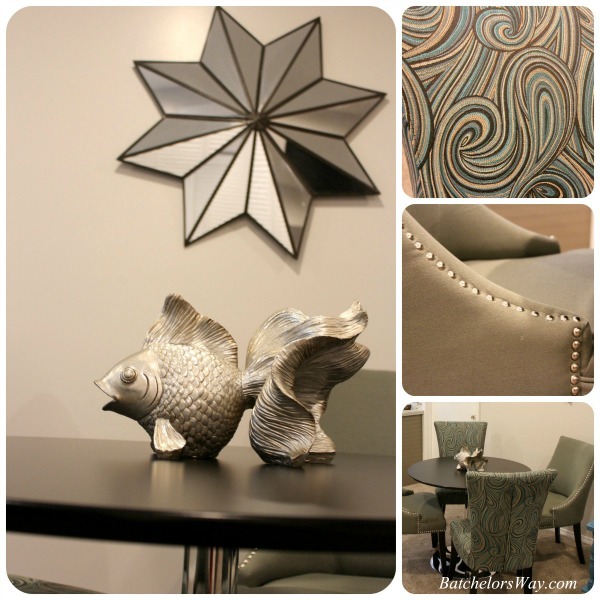 Details make the room! I know I can't say that enough. These spike sea urchins looking things are a good example of cool details. We actually bought them at Target. They started out a dull gold color. We add blue spray paint and then handed painted many of the tips a bright gold. They really help spread color around the room. You can see the other two later in this post. I can't leave this corner with out mentioning this awesome lamp that we picked up at OverStock.com Outlet Center. It's stain glass color and texture work super great in this room. Last but not least is the actual TV corner. Nana already had the TV, we just added this awesome stand we found on clearance at R.C.Willey. 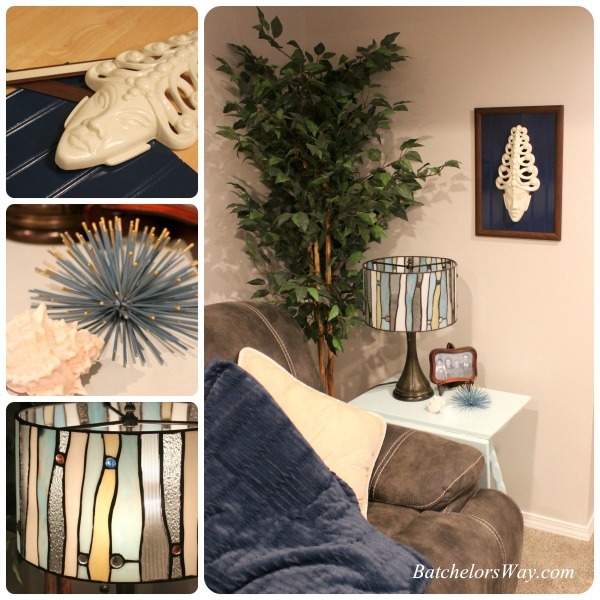 To brighten up the corner we added the two other spikey décor things that I mentioned earlier. We flanked the TV with pictures of Nana and her parents when she was a little girl. We took three plastic frames she already had and painted them three shades of blue. Creating an ombre effect. On the other side of the TV is what I like to call, The Peacock Artwork. Believe it or not we found this at a second hand store. It originally had a base, which we cut off with a hack saw. Then we painted the centers with a metallic peacock blue craft paint. We mounted it with screws and spacers. This let the rings cast shadows that added to the artistic feel of the piece. Did I mention I really like this piece? Here are some details to look at just because I like details!!! It's beautiful and super functional. We have already used it for a few parties and get together. Porthole Curtains with a view! You are super amazing!!! 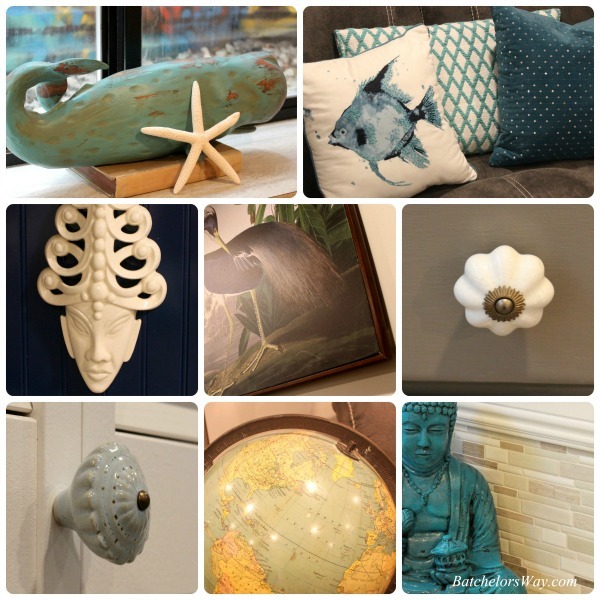 Love it all, especially the urchins and the circle metal wall sculpture. Ah-mazing. You're so creative! I love love the kitchenette wall, but common, all those little details are the best, it's all beautiful! Wow, what an amazing transformation. Loved seeing all the details up close! 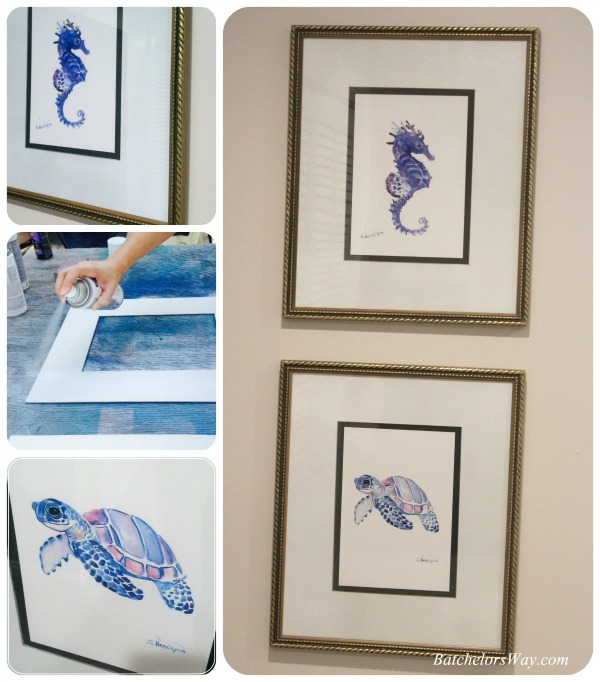 Where did you get the 2 prints of the seahorse and turtle? LOVE them. Love the the bird arwork and the "peacock" wall --what an awesome find! 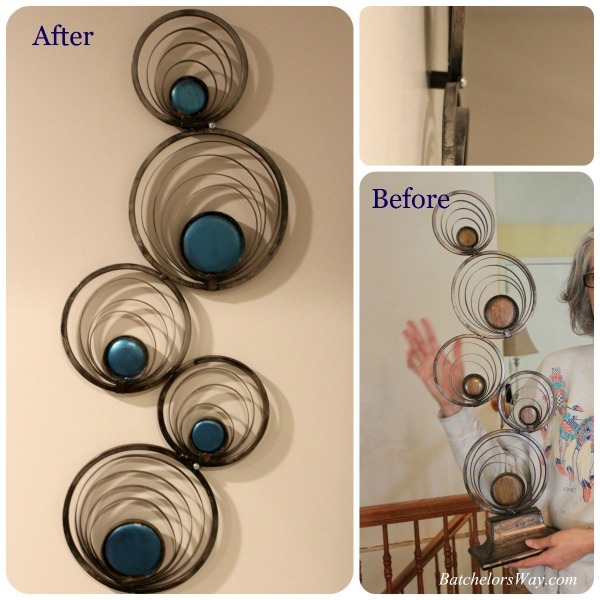 I wouldn't have thought of cutting off the base and painting the inside circle and then putting it on the wall--love the look. I really love your idea of turning the bamboo blind on it's side, framing it, and painting a map on it! Wow, it's so cool. You have such neat, out-of-the-box ideas that turn out so amazing. It looks like such a great place to watch movies or have a party. I was interested what you spent on it. 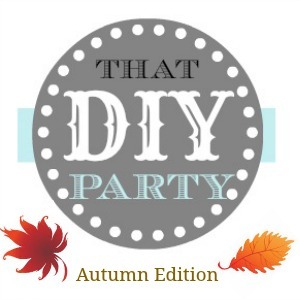 I know you did some thrifting/DIY-ing, but you also ordered and purchased items new, including furniture and a sectional (which looks amazing and you didn't mention where on that one). I'm sure I'm not the only one that would love a price breakdown if you care to share. I love seeing your transformations--can't wait to see what you do next! Thanks for sharing. Once again you have done a beautiful room make over! I love your attention to detail. The painted window well is so cool! I always love to see how you repurpose thrifted items.